Here is a updated pic of WF. I added most of the beaded sash. Unfortunately the picture blurs the cream colored beads at the bottom. POOO, the weekend is almost over. It was a fun one though!! On Saturday, I went to meet some other stitchers to chat and stitch. I have the lovely opportunity to meet Jo. It was fun to get to know her and see some of her wonderful projects in person. 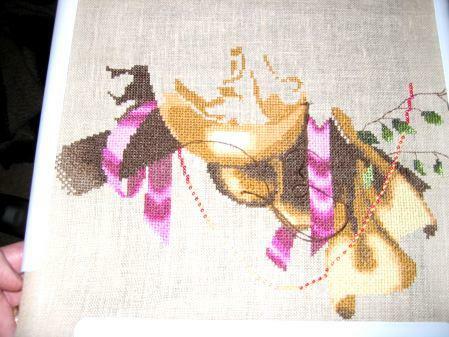 I stitched on the wedding sampler. I am working on. After stitching for several hours, I picked up Allen and we went out to dinner for his birthday. We initially were going to go to one of the new restaurants at Tyson’s Corner, but after taking forever to find parking spots and shopping a bit, the waits were outrageous. Thus, we drove back home and ended up trying an Irish restaraunt in town. We had never been before. We broke out of the norm for our usual choices when eating Irish food, but had some really good chicken dishes. They were delicious. Today, Allen and I were both very productive. Yeah for us. And I exercised. Yeah me. Now I get to spend the rest of the evening stitching. I also finally mailed off those charts to the four ladies who claimed them on Saturday morning. Sorry it took so long, it was a heck of a week. I really hope that you enjoy them!! It’s looking fantastic. Keep at it!